A dollar earned in Arkansas is worth more than all but one other state in the nation. That’s according to a recent report compiled by the Tax Foundation. 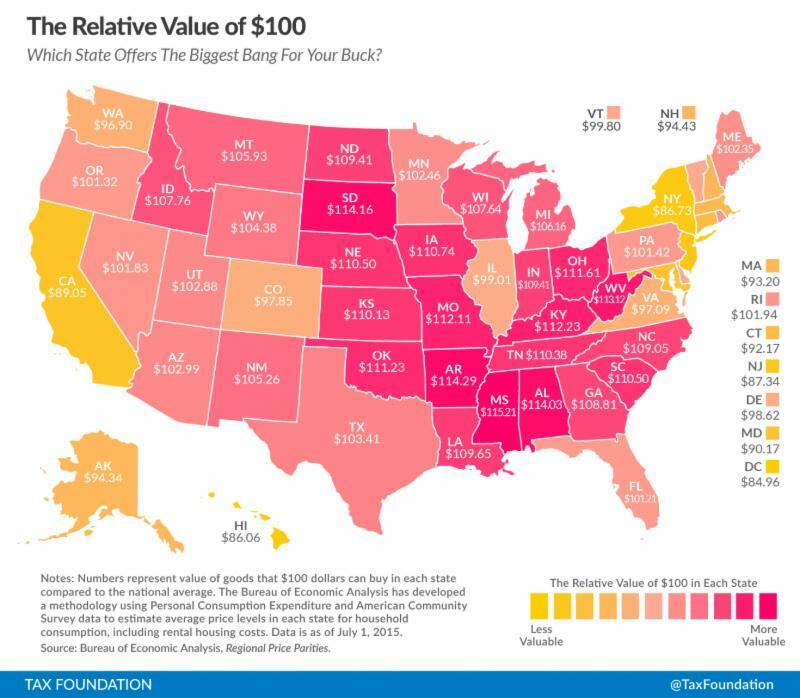 The relative value of $100 in Arkansas is actually $114.29. That’s $10.88 more than $100 is worth in Texas, $3.06 more than in Oklahoma and $2.18 more than in Missouri. In general, a dollar in your pocket goes much further in the Midwest or South than New England. New federal data, showing how prices differ across state lines, is visualized in the map below. The top two states where a dollar stretches furthest…Mississippi and Arkansas…enjoy prices generally about 13 percent below the U.S. average. A dollar buys the least in D.C. and Hawaii, where prices are nearly 18 percent and just over 16 percent above the national average, respectively. The map is based on a relatively new, but powerful measure called Regional Price Parities, which reflect the differences in price for a number of different goods in each state and has implications for everything from job relocations to public policy. Take the example above, from the Tax Foundation. Per capita income is almost the same in Nebraska and California, but when you consider purchasing power, Nebraska surges ahead in terms of the value of said income, according to the Tax Foundation.